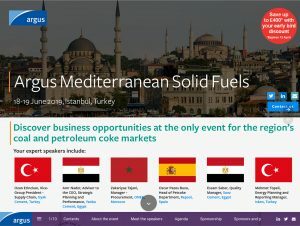 DHD have produced the digital event brochure for Argus Mediterranean Solid Fuels which takes place on 18-19 June 2019, Istanbul, Turkey. Discover business opportunities at the only event for the region’s coal and petroleum coke markets. Meet some of the biggest and most dynamic buyers and suppliers in coal and petroleum coke in the region’s largest solid fuels market. Get critical insights into physical trade, logistics challenges, pricing trends, regulatory changes, and fundamentals influencing shifts in solid fuels demand. Save time and money – Your chance to meet with a hard-to-reach community. Tupras, Cemex, HeidelbergCement, Socar, Engie, Uniper, Mercuria, CMC Coal Marketing, EDP, Eren, Akcansa, ONE, Torvald Klaveness, Drummond, Shell, Reliance Industries, Javelin, Bettercoal, Mitsui are just some of the organisations that regularly attend. Unique focus on the physical trade of the commodities – Get all the updates you need for your business, including a comprehensive view on the physical trade of products. Key topics on the agenda include challenges in fuel procurement, supply/demand outlooks for coal and petroleum coke, pricing trends, regulatory reforms and much more. Informal networking opportunities – With more than 10 hours of networking time, live digital Q&As, dedicated meeting spaces and a networking app, there is no better way to interact with this exclusive community. Turkish leader’s panel: Meet the region’s biggest buyers. Live debate: Buyers meet the sellers — how can buyers deliver the most cost-effective procurement strategies? How can suppliers anticipate buying behaviours? The supply chain joins the debate to address the balance of fuel quality and costs. Cement manufacturers best practice and fuel need: With continuous growth opportunities in the Mediterranean region for cement manufacturers, how can they capitalise most effectively and what does this mean for coal and petroleum coke demand? Raise your profile in front of international and regional decision makers from across the coal and pet coke supply chain. Bespoke opportunities are available that can enhance your exposure to this captive audience and maximise your time at the event. Share your expertise and position your organisation as a thought leader. If your main objective is to increase the visibility of your brand, we offer a number of high-impact branding opportunities at the conference. From lanyard or gift sponsorship, to pre-event and onsite advertising opportunities — on stage or through the conference networking app — we can design a package to suit your specific needs. Make personal business connections with hand-picked senior decision makers during an executive briefing, or host a themed table during the extended networking lunch breaks. Sponsor a number of the networking activities, or join an exclusive showcase of the newest technologies, innovative products and services at the Argus Mediterranean Solid Fuels exhibition. Reach an even wider audience of coal and pet coke market participants through a presence on the Argus conference website, social media channels and marketing campaigns. 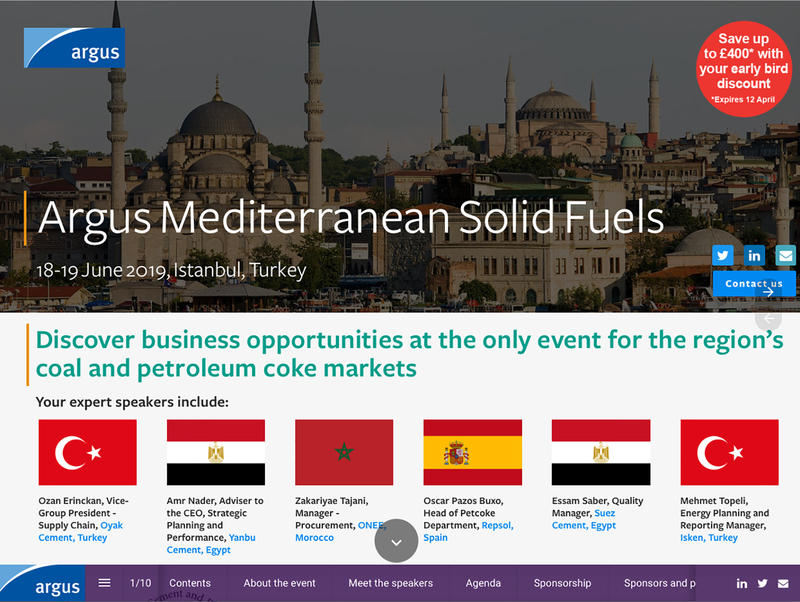 Talk to Argus directly to get the most out of the sponsorship and exhibiting opportunities at Argus Mediterranean Solid Fuels.